Ariba is the world’s foremost business commerce network and leading cloud based procurement and invoicing application. It has the world’s largest web-based trading community to help companies DISCOVER, CONNECT and COLLABORATE with the global network of partners. SAP bought Ariba few years back, and now it is known as SAP Ariba. SAP Ariba provides innovative business models to help you modernize and grow your business. Most of the businesses suffer from a poor collaboration between buyer and trading partners. Because of this lot of time is wasted, sales opportunities are missed, payments are delayed and hence creates limited visibility to decision makers. SAP Ariba has its own network called Ariba network with more than 1 – 1.5 million companies registered on it. This enormous database provides better collaboration and is also a central point platform for buyer and trading partners. This platform provides a user-friendly interface that seems native for anyone who shops online. SAP Ariba supports both sellers and buyers. Ariba platform provides sellers, the ability to manage catalogs, bids, purchases, and invoices and it provides buyers with the ability to search for suppliers, negotiate savings, purchase goods and services and track expenditure. It is a single solution which offers better features and functionality in sourcing, contract life cycle management, invoice management, supplier life cycle management, and MDM catalog. These extended features and functionality of Ariba helps both do better business, which existing ERP’s are not capable of offering. The business process is divided into two different processes – upstream and downstream. Below picture displays the available solution components of SAP Ariba. 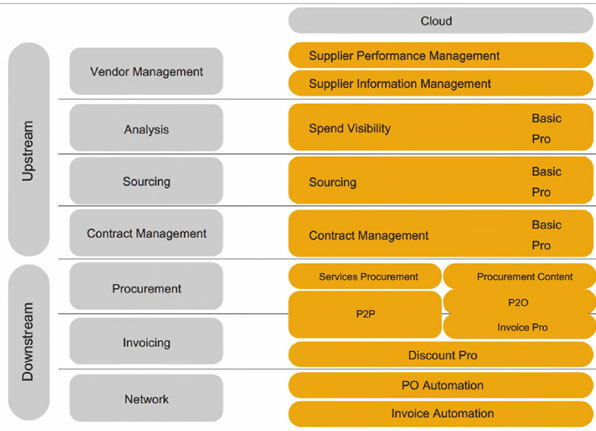 SAP Ariba can be seamlessly integrated with any procurement ERP solution like SAP, PeopleSoft, Oracle, IBM Maximo and Others. The administrators can export master data from SAP ERP to Ariba seamlessly. The transactional data can be updated bi-directionally or in real time. Ariba integration toolkit – A Java-based tool that Ariba provides to upload master data or download transactional data. Ariba integration toolkit reads the CSV files in SAP ERP – zips them, sends them as MIME messages using the HTTP post – to the Ariba procurement solution. The data transfer tool is an integral part of Ariba integration toolkit to import master data and transactional data. Recent SAP transports should be installed in SAP which consists of Ariba specific ABAP programs. Steps on how the master data information flows from SAP to Ariba using the file based integration method are shown below. It extracts master data from SAP and converts to a *.csv file. The *.csv files are then transferred to the Ariba using the Ariba integration toolkit. The above figure illustrates the integration of master data flow using file-based integration method. Steps shown below indicate the flow of transactional data information from SAP to Ariba using the file based integration method. The data transfer tool exports data from Ariba procurement solution in the form of *.csv files. ABAP program then read these *.csv files and transfers data to SAP ERP. ABAP program then retrieves the status of each export transaction from SAP ERP. The data transfer tool reads these *.csv files and updates them into Ariba. The web services are used for real-time integration of Ariba with SAP ERP using SAP PI (Process integration). The integration setup using SAP PI is available, by default. If any other application system is being used, through an SOA supporting middleware, then it requires the complete set up to be done manually. The web services generate a SOAP message based on the WSDL. It dispatches it to a web services server, through SAP PI, using the configured URL. The direct connectivity method uses the *.csv files. The *.csv files containing the master data is sent to the Ariba system through SOAP messages to update. The direct connectivity integration method for master data is available from Ariba cloud integration release 4.0 and later whereas importing transactional data from release 6.0 and above. There are two different ways through which the mediated connectivity method can be used. First one is by providing a SAP PI layer to exchange the data and the second one is by sending the information as SOAP messages. The mediated connectivity integration method for master data is available from Ariba cloud integration release 5.0 and later and transactional data from release 6.0 and later. I’m trying to send supplier data to Ariba Sourcing through ITK but getting some issue of not creating any supplier in Ariba Sourcing. I’m using Incremental-masterdata.batch file to send the data and file is successfully reaching destination but not getting any new supplier. Please provide me standard supplier.csv file and suggestions. You can run the Incremental change transactions either using the Ariba Integration Toolkit or directly while running the master data events to pick up the new, updated, or deleted changes and you can also download the standard .csv file from Ariba Network. The supplier incremental load uses the /ARBA/VENDOR_INCRMENT_EXPORT function module and supports the following events:●VENDORCREATED●VENDORCHANGED. The /ARBA/CHANGE_DOC table captures all the changes for the supplier incremental load event.● The business object LFA1 is extended to the sub object /ARBA/LFA1. The change or delete events for a supplier, supplier location, and remittance location is captured using the business object and event linkages. In the transaction code, SWETYVP, create a link between the function module /ARBA/CHANGE_DOC and the//ARBA/LFA1 for the VENDORCREATED, VENDORCHANGED, and VENDORDELETED events. In the Transaction code /osm30, go to the /ARBA/TVARV table.2. Selection value: To be specified by you. How to transfer transaction data from Ariba to SAP-ECC? For example transferring PO from Ariba network to SAP-ECC? Is there any setting required? We are using direct connect. 1. You must download and import the transport requests into your SAP ERP system. 2.Create a logical port in the SOAMANAGER for the consumer proxy class: /ARBA/CO_MIOUT_SYNC_ARIBA_DOWN. 4. Before you export the transactional data, you must create the Authorization Object class. 6. Create a logical file path for the ISMW_ROOT. This is only required to export data for purchase order header status, remittances, and any status updates sent for the transactions through the Direct Connectivity Integration method.